Are you also crushing on Veere Di Wedding Celebrity Lehengas? Ever since the movie trailer has come out, I have been stalking the Veere Di Wedding Celebrity Lehengas. The best place to catch the celebrities is during promotions of the movie. From Swara to Sonam, all of the Veeres have been showing us just how to rock the desi style at weddings. If you have a best friends wedding coming up in 2018, Veere Di Wedding Celebrity Lehengas is just perfect for you. Isn’t this the perfect wedding palette for summer weddings? I am already sort of feeling cool just looking at her lightweight summery lehenga. This lehenga by Anita Dongre is one of her latest spring summer collections. Wondering what this beautiful Anita Dongre Lehenga costs? While the exact price is unknown, I do have some idea about similar lehenga prices by Anita Dongre. Check the link to see all of Anita Dongre’s lehengas. Ok, coming back to Swara Bhaskar, the beautiful actress was styled by stylist Chandni Whabi. Special mention to that gorgeous hairstylist Rupali Dhumal. I think that hairstyle just stole the show. Don’t you want to recreate the same look for maybe a mehendi or a best friends wedding function? Remember Punit Balana from LFW Spring Summer 2018? He did those really awesome pop red modern ethnic wear. Anyways, this time its such a joy to see one of his lehengas in trending ivory shade. Ivory Lehengas are hot this wedding season. Almost everyone from the bridal party to the bride herself (remember Sonam’s Mehendi outfit) is flaunting white. If you also want to own a budget ivory lehenga, check out the blog post for some amazing designer lehengas. I love how Swara Bhaskar has paired the otherwise monotone coloured lehenga with one statement earring. The look is complete, and she looks like a goddess. Do you love the Anita Dongre or the Punit Balana lehenga on her more? Often we forget that an Indian Saree sometimes can look even better than a lehenga. Ok, maybe not this saree in particular. But there are hundreds of brides who opted for saree on their big day rather than wearing a lehenga. Don’t believe me? Here are all the reasons for choosing saree over lehenga. Halfway through this post, I have completely forgotten that this post was just about Veere Di Wedding Celebrity Lehengas. But I am sure you wanted to see the Anarkalis, sarees, and other ethnic outfits too right? See I can read your mind already. I just love this baby pink Anarkali. So cute isn’t it? This beautiful Anarkali is a perfect piece to own. It’s easily reusable on various wedding occasions and is overall a good piece to have in your wardrobe. You can now shop Priyanka Singh Anarkalis and Lehengas on Ogaan, Carma Online, AzaFashions and Jivaana. Trust Sonam Kapoor to wear something out of the ordinary. If you want to stand out from the crowd, an electric blue shade lehenga like this will go a long way. The gorgeous lehenga designed by Abu Jani Sandeep Khosla is one of the best Veere Di Wedding Celebrity Lehengas. It’s stylish yet not too over the top. Plus I love how the only accessory is the earrings which keep the drama at bay. Keeping the offbeat fashion alive, Sonam Kapoor dressed in a distressed Denim Diksha Khanna Saree for one of the promotions of Veere Di Wedding. For a fun summer outing, this is a pretty bold look to carry. But I love how effortless Sonam makes it all look. The oversized white tee and the pre-draped saree. I give it full marks. But yea, I don’t have it in me to dress up so fancy. Do you? Btw, if you are wondering what does this denim saree cost, it’s priced for INR 22,000 and you can shop it on AzaFashions. Ok, I know I said Veere Di Wedding Celebrity Lehengas (only). But do you really want to miss out on other gorgeous shots from the movie’s promotions? Like take, for example, this ultra sweet summer makeup hair was done by ace MUA Namrata Soni. She has been Sonam’s celebrity hair and makeup stylist for years now. She even did her wedding makeup looks. But this one I just had to share. Doesn’t Sonam look ekdum 24 carat sona in these pictures? Special mention to those gorgeous Amrapali statement earrings. Like so pretty, isn’t it? Is it just me or are you also hoping for Veere Di Wedding promotions to continue forever just so we can keep seeing Sonam’s fashion? Sometimes I really have to look up a colour shade to sound like I-know-it-all and all wedding-bloggerishly-perfect. Sonam Kapoor stunned yet another time in a gorgeous ruffle airy flowy gown. Makes you want to steal it for summers, doesn’t it? Oho, that colour combination is so cute, so summery. Absolutely love this look. Now that Veere Di Wedding has released, which celebrity look during promotions was your favourite? Sometimes looking at new looks is actually refreshing. If you are someone who is bored of looking as pastels and whites and wants that pop of colour, then you will love Veere Di Wedding. 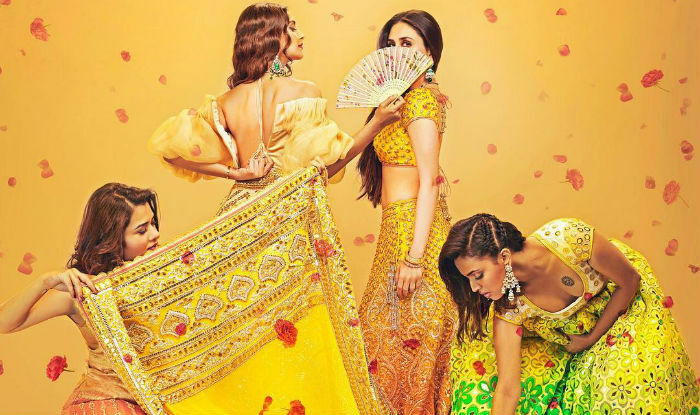 The designer duo has designer all of the Veere Di Wedding actresses costumes in the movie. Which celebrities style did you like the most in Veere Di Wedding Promotions?